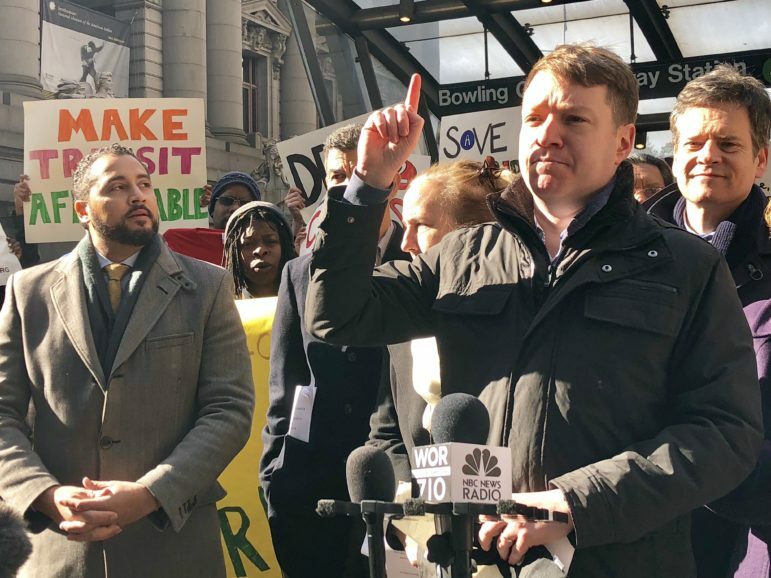 Riders Alliance Director John Raskin, elected officials and transit activists rallied Wednesday against the MTA’s proposed 2019 fare hike. 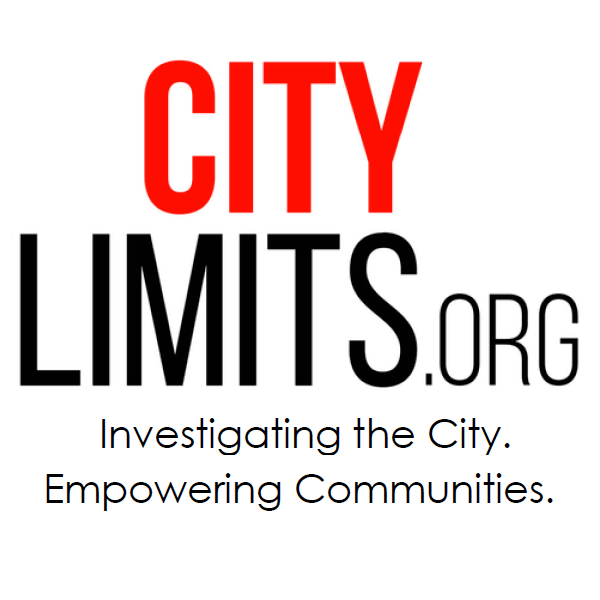 This story was produced through the City Limits Accountability Reporting Initiative For Youth (CLARIFY), City Limits’ paid training program for aspiring public-interest journalists. Transportation advocates are pushing back against the MTA’s plan to raise fares next year, saying straphangers shouldn’t be forced to pay more until lawmakers and the transportation authority secure a plan to fund improvements for the city’s deteriorating transit system. Dozens of activists rallied Wednesday across the street from the MTA’s headquarters in lower Manhattan, a day before the MTA board is expected to meet to discuss its 2019 budget. A preliminary version of that budget released in July proposed four percent fare and toll hikes in both 2019 and 2021 — and former MTA Chairman Joe Lhota warned last month that those increases may need to be even steeper, thanks in part to a continuing decline in subway ridership. But advocates on Wednesday said they oppose any fare hike, unless elected officials and the MTA can carve out dedicated funding for New York City Transit President Andy Byford’s “Fast Forward” plan to fix the transit system. It’s unfair, they argue, to force riders to shell out more money for service that continues to be poor and unpredictable. Riders Alliance and other transit groups are specifically pushing for the state legislature to implement congestion pricing, which would charge drivers to enter Manhattan below 60th Street, with the fees going toward public transit—revenue that would amount to over $1 billion a year, they say. But even that won’t be enough to cover the costs of the Fast Forward plan, which Riders Alliance estimates will cost between $40 and $60 billion over the next decade, meaning lawmakers will need to find other funding sources in addition to congestion pricing. “In reality, we will need a variety of revenue sources,” Raskin said. The state legislature is set to reconvene in Albany in January, though transit funding will likely need to be included in the state budget, the negotiations for which don’t take place until spring. But lawmakers say they’re hopeful the upcoming legislative session will lock down a plan for funding the subways, especially now that Democrats have the majority in both the State Senate and Assembly following last week’s election. But this time things are different, he added. The MTA has been implementing fare increases every two years since 2009, part of a rescue plan conceived at the time by transit expert and former MTA Chair Richard Ravitch. The last fare hike took place in 2017, when the cost for single subway and bus rides remained at $2.75 while the cost of weekly MetroCards increased by $1 and monthly cards rose from $116.50 to $121. “As we’ve been saying publicly for more than a year, the MTA’s financial condition is dire – we need long term, sustainable funding sources and more to close considerable gaps,” MTA Spokesman Jon Weinstein said in a statement Wednesday, adding that fares and tolls cover only half of the agency’s operating budget. “The fare adjustment options the board will consider are less than the rate of inflation and would raise badly needed revenue that goes directly towards improving service,” he said. In interviews with City Limits, subway and bus riders balked at the prospect of another fare hike. “I feel like we pay enough already,” said Keith Davis, who buys an unlimited MetroCard each month. Laurie Valeannie, who was waiting to board to M1 bus in Harlem, told reporters that she too finds the current fare unaffordable, and wants more reliable service. Donie Donahue, a 44-year-old Harlem resident, said he thinks current MetroCard prices are reasonable, but that any additional fees would have a real impact. “Like everybody else, the prices go up but your wages don’t go up. The service doesn’t seem to improve,” she said. Some East Harlem residents are less optimistic about the prospect of the new stations, and are particularly concerned about the potential disruption caused by their construction, which is estimated to take about nine years.